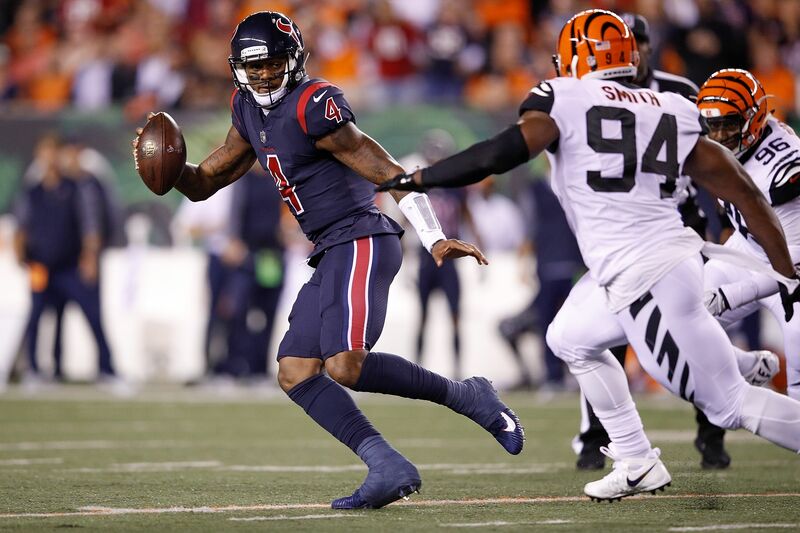 In his first NFL start, Houston Texans quarterback Deshaun Watson showed that while his potential is evident, he needs ample work in the pocket. The Texans beat the Cincinnati Bengals on Thursday night, 13-9. It was a hideous affair. It was the kind of game that people point to when they say the NFL is in trouble. However, the one intriguing storyline was Deshaun Watson, and whether he would pay immediate dividends. Houston traded up 13 spots in the first round to select the national champion out of Clemson, hoping he would solve its seemingly-eternal quest for a franchise quarterback. After spending the offseason talking up the virtues of patience and practice, Watson replaced starter Tom Savage in a 29-7 loss against the Jacksonville Jaguars. So how did Watson do in his first start? Let’s go to the tape for two plays that accurately depict what was shown. It’s 3rd and 6 on Houston’s first drive of the game. In this play, the Texans are going 10 personnel with Braxton Miller lined up at the top of the frame. He’s going man-to-man against Adam Jones. Cincinnati is playing a single-high safety look while showing blitz. On the bottom of the screen, DeAndre Hopkins runs a slant inside. This is a perfect call against man coverage, but the Bengals are actually in a zone, as we see below. Cincinnati backed out of pressure and went into a traditional Cover 3 look. George Iloka is responsible for the deep third, and gives help on either side unless occupied (he’s not on this play). Watson should immediately know the ball has to go toward the boundary, and he has Miller running upfield while Jones is turned toward the line of scrimmage. Watson makes the correct decision to throw toward Miller, as we see in the next frame. This is a split-second before Watson throws. Iloka hasn’t moved off his spot and Miller is beginning to gain separation. In addition, Miller is giving Watson plenty of space to throw toward the sideline. This is crucial, as legions of receivers get themselves pinned to the boundary. Miller is providing a great cushion toward his left shoulder, where the ball needs to be placed. Jones stumbled and almost fell on the play. Iloka is closing in, but he’s nowhere near the play yet. A the bare minimum, this should be a 25-yard gain and a jaunt into Bengals’ territory. A nice move by Miller or a missed Iloka tackle and this is six points. Instead, the throws sails over the head of Miller as shown below. Watson made the correct read, which is encouraging. Still, he needs to stick this ball in Miller’s hands. If the Texans are going to be a playoff team, they need to make plays like this considering their offensive limits.